Greek yogurt is a staple of many peoples diet in the modern age, it is healthy and delicious and can be used in a variety of recipes. It has a different preparation process to normal yogurt, which is why there are specific Greek Yogurt makers out there. The Oster CKSTYM1012 Mykonos is one of the leading Greek yogurt makers on the market. It comes with a lot of hype, so does it live up to expectation? Here is the full feature list of exactly what’s on offer. By just looking at the advertisements, you would certainly think this is the yogurt maker to raise the bar in the industry (and it does raise the bar a bit). From the looks of it, you would say this maker comes with a timer. But sadly, it doesn’t. I know there are other great yogurt makers without timers on the market. In addition to this, the maker comes with a manual. If you are new to making yogurt, you might want to gain a basic knowledge before you read too much into it. As a solution, simply search on the internet on how to use a yogurt maker. But despite a couple of shortcomings, I must admit, this is one of the best Greek yogurt makers on the market. Using it is quite easy once you get the hang of it. And the yogurt it makes is of top quality all the time. Considering how expensive Greek yogurt is, this is one you should add to your arsenal, as it can even save you money in the long run. If you are into looks, I find the Oster CKSTYM1012 Mykonos quite elegant and even has an LCD display on the front. And if you have a big family, this is definitely for you. It can make you more yogurt than the trusted YM100. It comes with six 7oz glass jars and one 17oz plastic container. Cleaning these is a breeze. 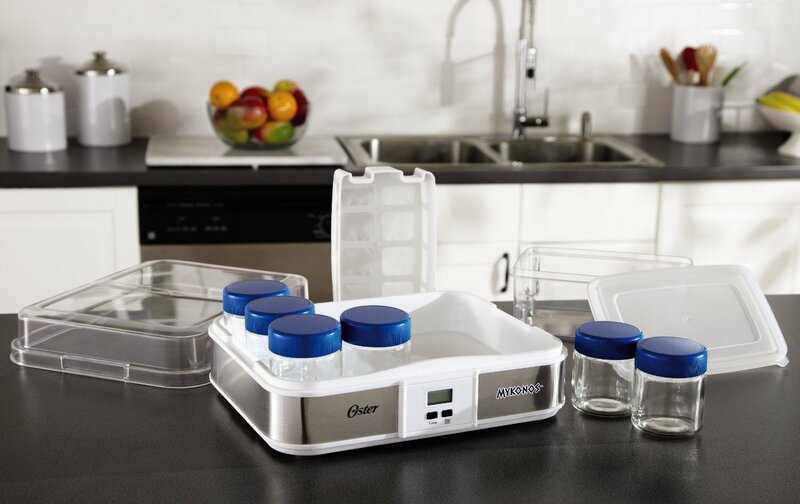 For fans of Greek yogurt, the Oster CKSTYM1012 is absolutely perfect for you. A Greek yogurt strainer is already included. When you are done making your yogurt and want to keep your pieces safe, you can simply fit them nicely inside the maker, which is a great storage solution. The Oster Mykonos has received favorable reviews on Amazon. It has a very impressive 4.2 out of 5 stars. Many recommend it for making great tasting yogurt, being easy to use, clean and the fact that it saves money as store bought Greek yogurt is expensive. If you are looking for a Greek yogurt maker, I would recommend you get the Oster CKSTYM1012 Mykonos. It is affordable and comes with great features, and represents good value for money. The resulting product is always absolutely brilliant, this is one of the most consistent and brilliant yogurt makers available! Comes with our top recommendation. This entry was posted in Oster and tagged Greek Yogurt, Oster.